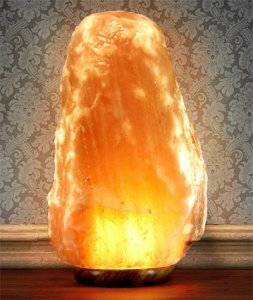 Monster Himalayan Salt Lamp For Larger Rooms - 66~80 Lbs. Check out this absolute monster of a himalayan salt lamp! Weighing-in somewhere between 66 and 80 Lbs. this whopper has got what it takes to set the mood in open-plan spaces. With all the natural colorings and highlights we have come to love from these beautiful pink salt crystals, this one is sure to make a big impact in whatever size room you put it in. Dubbed “Everest” for it’s sheer size, this lamp lives up to it’s name capturing the natural beauty and splendor of the real thing (not to mention that this crystal comes from the same region). Now, aside from the warm glow Himalayan salt lamps give off (and everyone raves about), they also produce a steady stream of negative ions when the light is on. These ions have some wonderful air purification properties (reducing allergens around the house) and also have a positive impact on the sleep and mood of the occupants – see our blog for more info on Himalayan salt crystals. The general rule of thumb for the rate of ion production is dependent on surface-area, the larger the better. Since this lamp is so huge and has a ‘roughly chipped’ outer, it has got surface area in spades. It also comes with a much brighter light bulb than most others on the market, and the light and warmth from the bulb is what acts as a catalyst for ion production. With that in mind, the following weight and dimensions are approximations. Weight: in-between 66 and 80 Lbs. All of this sits on a wooden base which makes for easy assembly of the lamp. Now the price might seem about as steep as Everest itself (looking at around $170) but this really checks out when you consider the size of the space it will go into, and if you were to get the same effect from having multiple smaller salt lamps. If this monster lamp is too big for you place or budget, take a look at the various other styles and sizes we have to offer.